Shasta daisy, also known by Leucanthemum x superbum, is a perennial flower with white petals and a gold center. Cultivars of Shasta daisy include Becky, Aglaia, Snowcap, May Queen, Old Court, Crazy Daisy and Alaska. Daisies may form single or double petals with curls, frills or twists. 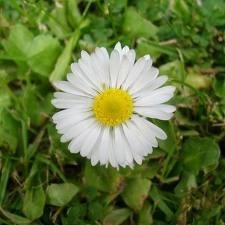 Becky, Crazy Daisy, Aglaia and Alaska grow to about 3 feet tall, with differences noted in the petals. Becky and Alaska are the least showy, with single petals. Aglaia has double flowers, Old Court produces a frilly, twisted flower, and Crazy Daisy has double, frilly flowers, according to University of Illinois Extension. 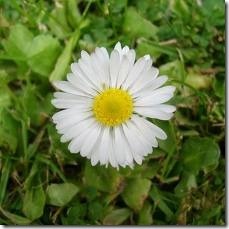 Daisies prefer an area with full sun to partial shade. White daisies will bloom from June through September and should be deadheaded throughout the summer to encourage new growth and additional blooms. They prefer full sun or partial shade and moist soil. Seeds may be harvested after the bloom dries. Daisies’ seeds may be harvested to start new plants in other areas of your flowerbed. After the bloom has completely died, you may dry them and remove the seeds from the brown center. Seeds should be allowed to dry for a couple of days before storing or replanting them. Daisies are very showy when planted in groupings. The Perennial Plant Association named the Shasta daisy cultivar Becky the "Perennial Plant of the Year" in 2003, citing its hardiness, beauty and easy maintenance.